If Rod Rosenstein was having a good day, Lindsey Graham just ruined it. During an appearance Sunday morning on CBS’s “Face the Nation,” the South Carolina Senator said he’s going after Rod over a “bureaucratic coup” to oust President Trump. Senate Judiciary Committee Chairman Lindsey Graham pledged Sunday to hold a hearing to determine whether top Justice Department and FBI official discussed a “bureaucratic coup” to remove President Donald Trump from office. 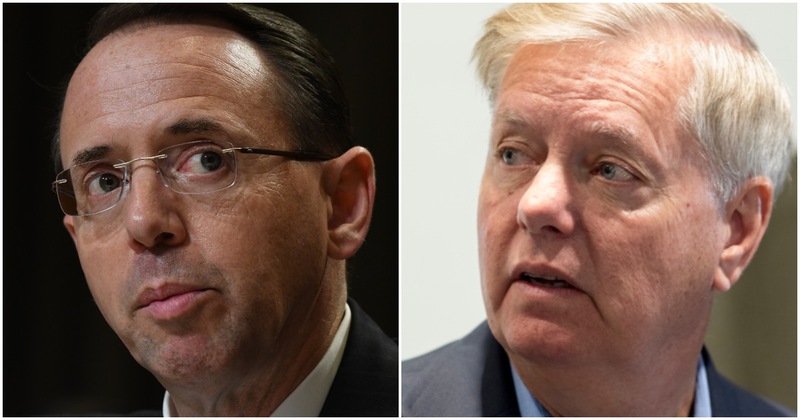 Graham said in an appearance on CBS’s “Face the Nation” that he is willing to subpoena Deputy Attorney General Rod Rosenstein and former FBI Deputy Director Andrew McCabe to answer questions about an alleged discussion to use the 25th Amendment to remove Trump from office. McCabe claims that Rosenstein brought up the idea of using the Constitution to remove Trump during a meeting of FBI and Justice Department officials on May 16, 2017, around a week after Trump fired James Comey as FBI director. 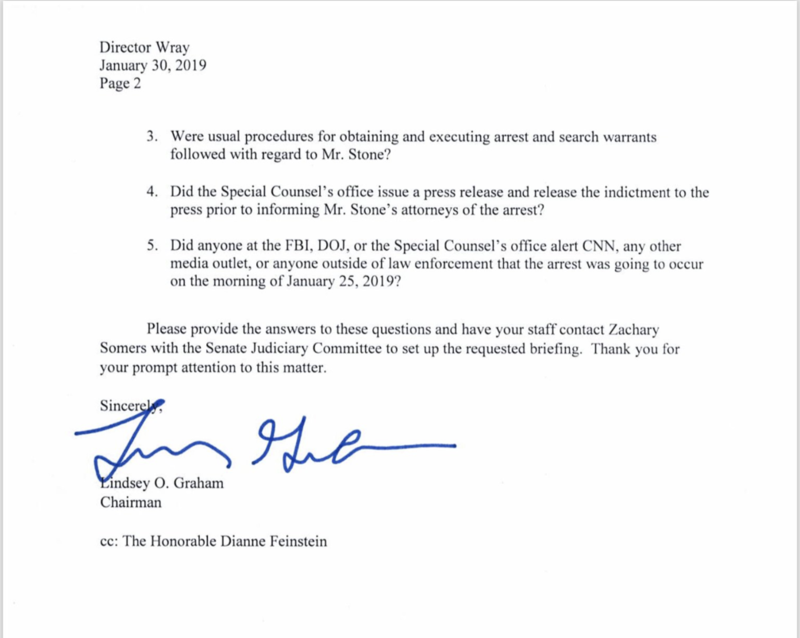 Graham is demanding answers from the FBI after Roger Stone’s arrest. Like the rest of the nation, Graham wants to know what’s up. 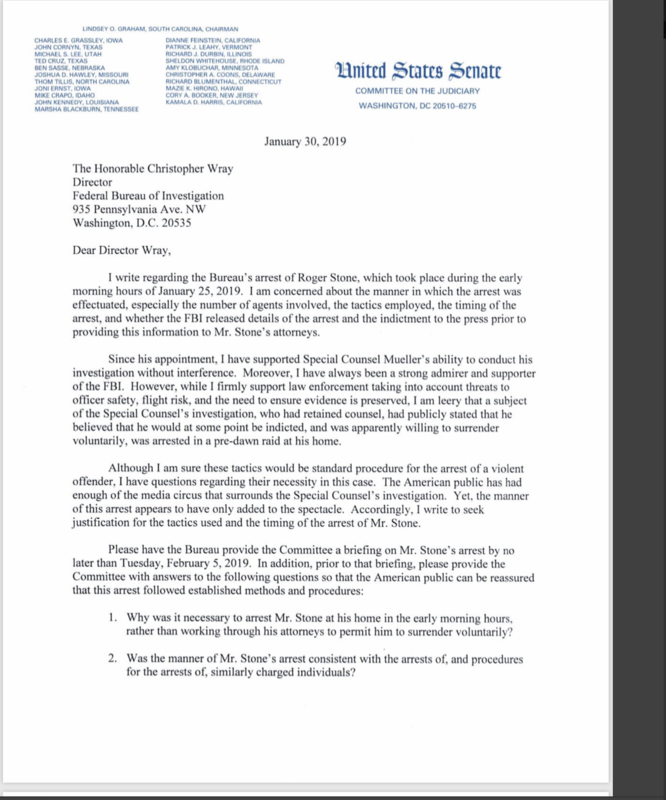 He sent a sharp letter to FBI Director Christopher Wray demanding answers. Today I wrote to the FBI about the arrest of Roger Stone. 1) Why was it necessary to arrest Mr. Stone at his home in the early morning hours, rather than working through his attorneys to permit him to surrender voluntarily? 2) Was the manner of Mr. Stone's arrest consistent with the arrests of, and procedures for the arrests of, similarly charged individuals? 3) Were usual procedures for obtaining and executing arrest and search warrants followed with regard to Mr. Stone? 4) Did the Special Counsel's office issue a press release and release the indictment to the press prior to informing Mr. Stone’s attorneys of the arrest? 5) Did anyone at the FBI, DOJ, or the Special Counsel's office alert CNN, any other media outlet, or anyone outside of law enforcement that the arrest was going to occur on the morning of January 25, 2019? Since his appointment, I have supported Special Counsel Mueller’s ability to conduct his investigation without interference. Moreover, I have always been a strong admirer and supporter of the FBI. However, while I firmly support law enforcement taking into account threats to officer safety, flight risk, and the need to ensure evidence is preserved….. …..I am leery that a subject of the Special Counsel’s investigation, who had retained counsel, had publicly stated that he believed that he would at some point be indicted, and was apparently willing to surrender voluntarily, was arrested in a pre-dawn raid at his home. Although I am sure these tactics would be standard procedure for the arrest of a violent offender, I have questions regarding their necessity in this case. Former FBI lawyer James Baker said two Trump cabinet members support invoking the 25th Amendment to remove POTUS from office. In short, don’t mess with Lindsey Graham. You’re not going to win.